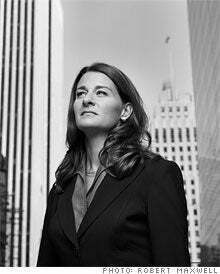 The beautiful, smart and, no doubt, fragrant Melinda Gates is the subject of a mahoosive profile in Fortune. And, aside from the philanthropic angle (Bill and Melinda, it is estimated, will give away around $100 billion from their eponymous foundation) it gives a fascinating insight into the home life of Mr. and Mrs. Gates—including the fact that the Apple II she inherited off her dad as a teenager was what got her interested in computer science. More choice nuggets below. • "Yes, we're a couple that has fun discussing fertilizer while we walk on the beach," says Bill, who says he's looking forward to haranguing pharmaceutical companies to do more for the developing world. "Nobody gives them a hard time. That job is natural for me to do." • Melinda's a better runner than her husband and, as well as running the Seattle Marathon, has climbed 14,000-foot Mount Rainier. • Would Warren Buffett have given the Gates Foundation his fortune if Melinda hadn't been in charge? "I'm not sure," he replies. • She reveals how Bill asked her out on a date after they ran into each other in the parking lot at Microsoft: "We talked a while, and then he said, 'Will you go out with me two weeks from Friday night?' I said, 'Two weeks from Friday? That's not nearly spontaneous enough for me. I don't know. Call me up closer to the day.'" • Chez Gates, Wednesday night is family swimming night, Friday night is family movie night.